Well, two relative newcomers to the ever-interesting world of bible versions. These are pretty edgy, so don’t let small children see them or their image of Jesus will be forever…awesome. 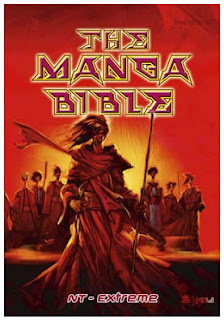 First, the Manga Bible is an bible styled after Anime. Jesus with Super Saiyan powers, I’m excited! Since Manga is focused on action, then the Pauline letters are probably pretty boring. But the action Jesus has got to kick some tail! Editorial: I do worry a bit about focusing on the action and story of Jesus while missing out on the motivations and the theology. But then again, narrative is very powerful, so who am I to be an old fogey about this?! Second, the Bible Illuminated: The Book is a pictorial representation of key verses featuring MLK Jr and Angelina Jolie (hat tip). This reminds me of the biblezines that reach out to tweens and teens by putting the bible in magazine format. Editorial: I can’t stand bible paraphrases or Zondervan bibles that do the interpretation for me. By linking images to bible verses, I think they may push me in directions that I don’t really want to go. Like how “In the Jungle” was ruined by Ace Ventura: Pet Detective. Or how a relative ruined all the hymns in the hymnal by telling me to add “between the sheets” after each title. Sigh. Well, there’s two new versions for ya. What do you think of them? 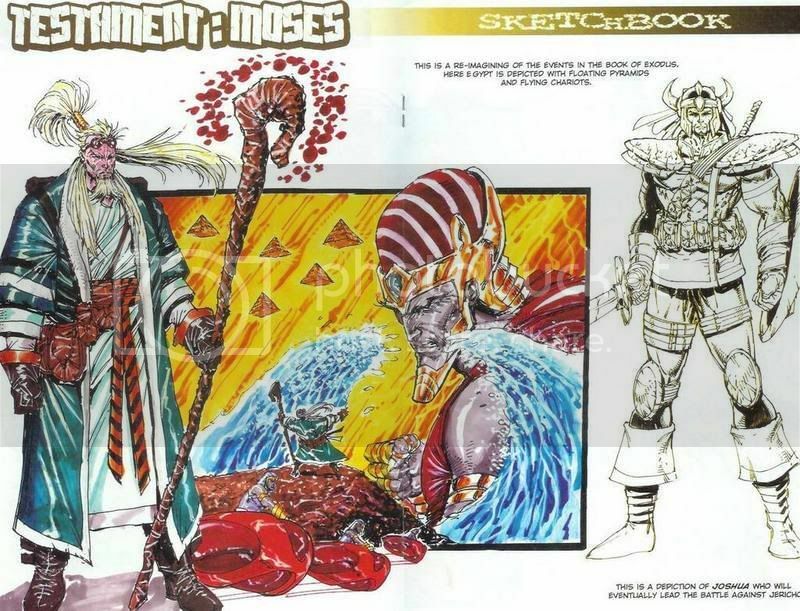 Moses with a tiny head WAY out of proportion with the rest of his body. Did I mention Liefeld can't draw hands? When did David get a hoverboard? I don't remember that in the Bible. 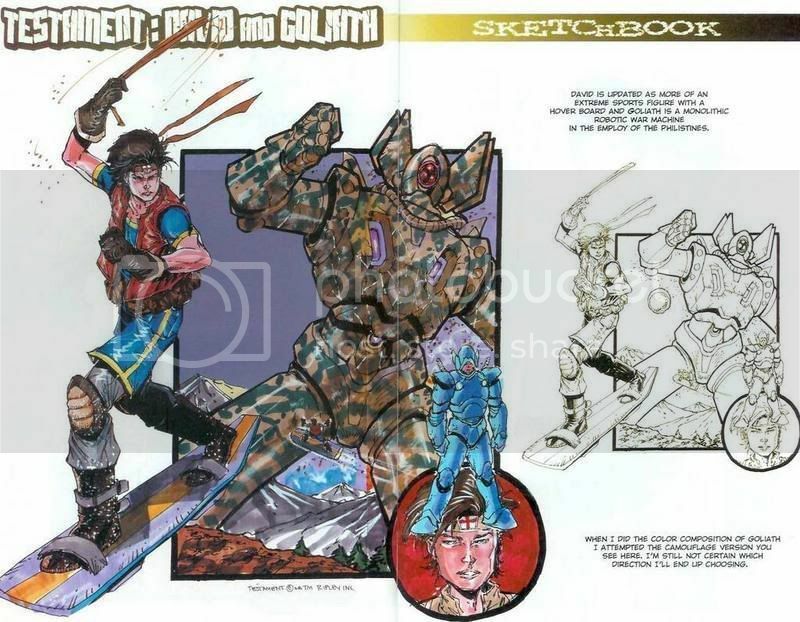 And is that really Goliath or one of the Transformers? Nothing beats the Brick Testament in my book. @ carl, those are interesting pictures, and very weird. @ mewize, I think our understandings of biblical translation and sin are different. Each of the Gospels (the “good news”) was written to a specific audience, like Matthew’s is focused on those with Jewish backgrounds, and Luke is focused on Gentiles. Given the level of adaptation in the Gospels, then how is forming the Good News in ways that are receptive a betrayal of the story of Christ? The lord has blessed me in ways that one could not understand, I will pray for you all to see what I see.